I’ve been meaning to write something about a whole slew of Watchmen parodies that have started cropping up all over the net in anticipation of the movie, and seeing Kevin Cannon’s Blotchmen today reminded me of this endeavor. 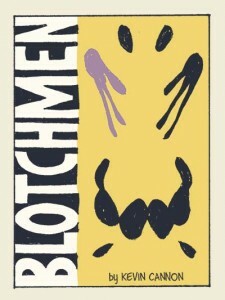 Blotchmen was created as part of the 24 Hour Comics Day event right here in Minneapolis. (I should have at least stopped by to check it out while it was happening. Maybe next year.) I think it’s especially cool because as well as parodying Watchmen, it also pays homage to a couple of my favorite children’s books at the same time. Just go read it! Back when I was looking for this stuff, I discovered the official watchmen movie site hosts a feature/page they call The Gunga Diner, that looks to basically just aggregate all the Watchmen parody stuff it can find. It’s cool, but what I don’t like is that there are a lot of entries that don’t cite their sources. Maybe they just had the stuff emailed to them, but the Watchmen Peanuts sketch they host can easily be found to have originated from Evan “Doc” Shaner’s DeviantArt account. (Looks like it wasn’t a totally original idea, as Jeff Parker did something similar a while back.) Likewise the Lil’ Watchmen comic Gungan Diner hosts can be found (with quite a bit more digging necessary) over at the Silver Rage Archive/TOC. KO Fight Club, who I have linked to before, because it is a board gaming webcomic, has a whole page devoted to how they parody Watchmen (and another page about why). Here’s a cool illustration of Watchmen Watches. The Watchmen Movie site also hosts a page that links to a bunch of Watchmen fan films. I haven’t really watched them all yet, so I don’t know if that page is better about sourcing its material. And finally, if you haven’t seen it already, the Mad Magazine folks made a seven page Watchmen Parody (PDF format) in their signature style. It was apparently distributed at San Diego Comic Con earlier this year. This entry was posted by Martin	on Wednesday, October 29th, 2008 at 12:05 pm and is filed under adaptations, events, independent, links, movies, webcomics. You can follow any responses to this entry through the RSS 2.0 feed. You can leave a response, or trackback from your own site. I have somewhere a really awful b&w parody comic book called Watchcats, which came out before Watchmen had even been collected up as a trade paperback. It was of UK origin and I seem to recall it was screamingly unfunny.